Once the entire infrastructure needed for Veeam Cloud Connect is deployed and configured, it will be time for the service provider to configure the Cloud Connect environment itself. The first operation the service provider has to complete is to obtain and install the correct license to enable Cloud Connect. This step is required to be able to deploy the different components of Cloud Connect, so it should be the first activity when deploying Cloud Connect. 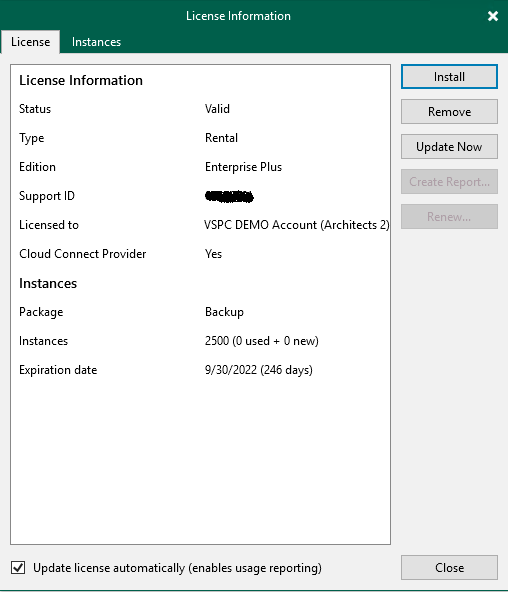 Important: The service provider needs to have the proper licenses for Veeam Cloud Connect VMs to offer Backup as a Service (BaaS), and Veeam Cloud Connect Replication VMs to offer Disaster Recovery as a Service (DRaaS). This book will not go into details about licensing and the auto-update features, so please refer to the User Guide for additional information. After the proper license is in place, the next configuration step is related to Certificates. Veeam Cloud Connect is reached by end users via public Internet, over a single TCP/UDP connection where the endpoint is one of the Cloud Gateways. The connection is protected with SSL certificates, thus a Service Provider has to obtain and use those certificates so that end users will be able to verify the identity of the Provider they are connecting to. Even if Veeam Cloud Connect has an option to use self-signed certificates, those are intended primarily for test purposes. In a production environment, a Service Provider should acquire and use a proper certificate, validated by one of the Certification Authority recognized by Windows OS. In this way, no alert or warning is raised upon connection, and the trust between the Service Provider and his users is optimal. To learn how to create and load SSL Certificates, and possible ways to automate certificate management, please refer to Chapter 8.1 and 8.2.